Which Implants do we use? Life with missing teeth can be challenging – not only does it affect your smile, it can also cause health issues. When it comes to tooth replacement, dental implants offer an effective and long-lasting alternative to dentures and bridges that can address the issues of missing teeth. At Expert Implants, we provide innovative implant solutions. No matter how many teeth you are missing, or even if you have been previously told you aren't a candidate for implants, talk to our experienced dental team about how we can replace gaps in your smile with dental implants in Southampton. They last a long time – at least 15 years and sometimes for decades. Because one implant can support up to three teeth, dental implants in Southampton can be a foundation for single crowns, bridges or dentures. Single implants are ideal for one missing tooth or a few missing teeth on a bridge, and implant-supported dentures can support a whole arch or full set of replacement teeth. To find out if dental implants in Southampton are the right treatment for you, get in touch and our team will book you a consultation appointment. 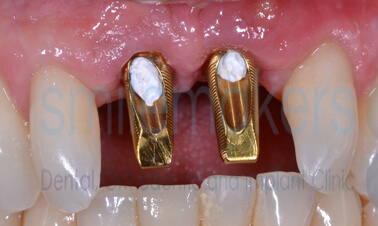 The successful businessman in this case had persevered with a partial denture since losing his front teeth in an unfortunate accident. Understandably he wanted a long-term solution that gave him the confidence to speak and eat in public. 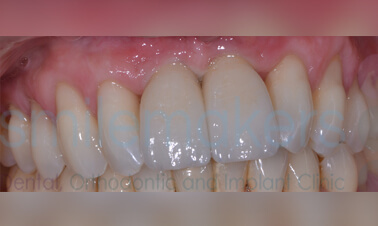 Following some teeth whitening, two dental implants were placed, giving a life-changing aesthetic and functional result. 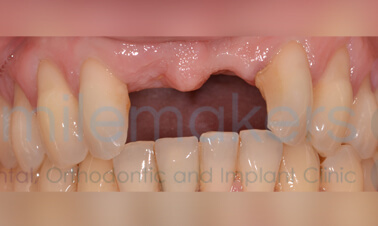 Find out more about what to expect from dental implant in Southampton at Smilemakers. We have more information about The Consultation or if you would like to speak to one of our friendly team members, they will be happy to go through with you what is involved. Call today - 023 8044 2626. 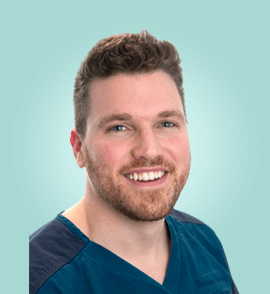 Tom has a Distinction Masters Degree in Aesthetic and Restorative Dentistry from the University of Manchester and is an active member of both the British and American Academies of Cosmetic Dentistry. A special interest in the placement and restoration of dental implants has led to him undertaking the Diploma of Dental Implantology at The Royal College of Surgeons of England. The main emphasis of his work is on providing superior results using the very latest techniques and cutting edge materials. At our dental practice we understand that technological advances can dramatically improve the experience for our patients that are interested in dental implants in Southampton. That is why we invest in such technology, such as the CT Scanner we have. 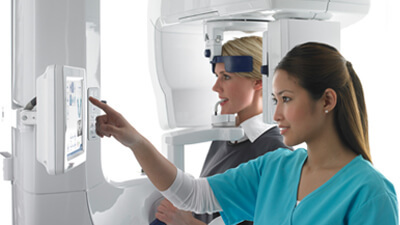 Did you know that you could get a CT scan in our very own dental practice? CT scans are used in dental treatments to ensure accuracy for dental implants and give the highest chance of success due to a high level of detail and an ability to precisely plot implant location. Want to get started right away? Smilemakers are delighted to offer you the option of 0% interest free credit and you can spread the cost of your treatment into manageable monthly payments. There's no need for you to worry... just provide us with a few details and we'll do the rest. This payment facility has been really popular with a lot of our patients requiring or choosing particular treatments which they were unable to fund all at once. 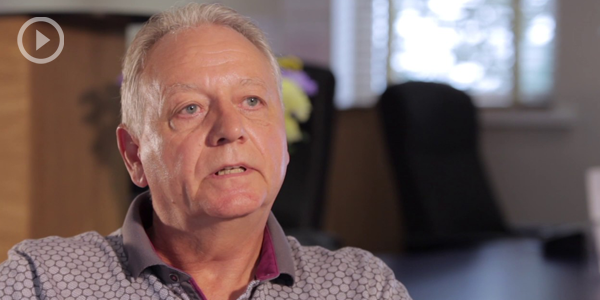 Rather than having to wait and save for the life-changing treatments, they opted to spread the cost and were able to get started straight away. 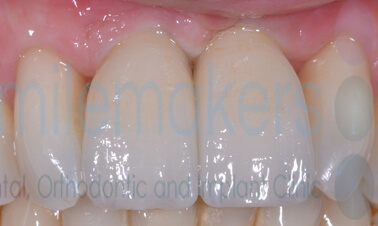 SMILEMAKERS IS AUTHORISED AND REGULATED BY THE FINANCIAL CONDUCT AUTHORITY UNDER REGISTRATION NUMBER 737333. If you have any questions about our finance options, please call our friendly team. Finance available to UK residents aged 18 and above. Credit subject to status. Smilemakers is authorised and regulated by the Financial Conduct Authority under registration number 737333. There is a minimum transaction of £500 required with this option and payment terms range between 6 and 12 months. The minimum transaction for this option is £1,000 and payment terms range between 12 and 60 months. Finance available to UK residents aged 18 and above. Credit subject to status. Smilemakers is authorised and regulated by the Financial Conduct Authority under registration number 737333. Copyright © Smilemakers. All rights reserved.